Is this common or what? A little over a year ago my crackberry phone cratered, locked up, and upset me so greatly with RIM and all its offering that I predicted its demise because of the way they treated me. I’ve got a pretty good track record. Piss me off and your company is likely to suffer greatly or cease to exist. In any case, one of the good things about the crackberry was the vault for storing various passwords. So I lost all of it. And a bad thing about WordPress is that it uses your email address to track access to your blog. Having experimented a bit with various formats I forgot about an older blog that I had started – and now by some computing magic my access was always redirected to the old blog. Hopeless to get help with it from WordPress. Their support is a black hole of silence. That is why I went with the Thesis theme for my art web site, http://byhugo.com rather than straight WordPress. I can only recommend Thesis, they have good support! Long story short, after some lengthy wrangling I seem to have killed off the old blog, and now finally have a way of updating this effort. So what is left to do on the press? The platen is back on the press, just needs calibrating. In January I’m buying the motor and drive controller for the C&P press. The first of my engravings has arrived, and I am anxious to get printing the fist limited edition! With temperatures outside in the -20 degrees C range, I also need to arrange for heat in the garage. After quite a delay (somehow you have to get the mortgage paid) I finally am getting back to the press. 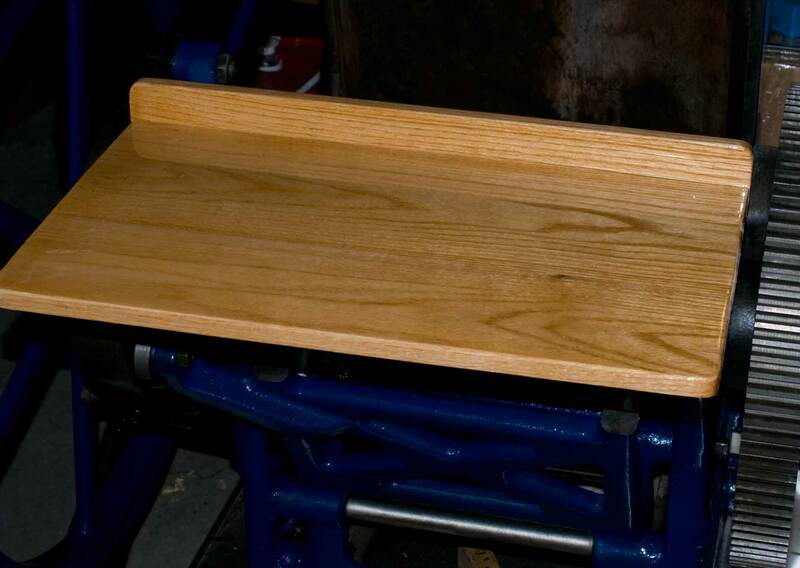 I had a plank of oak lying around from way back (sailboat building days) and decided to do something with it. 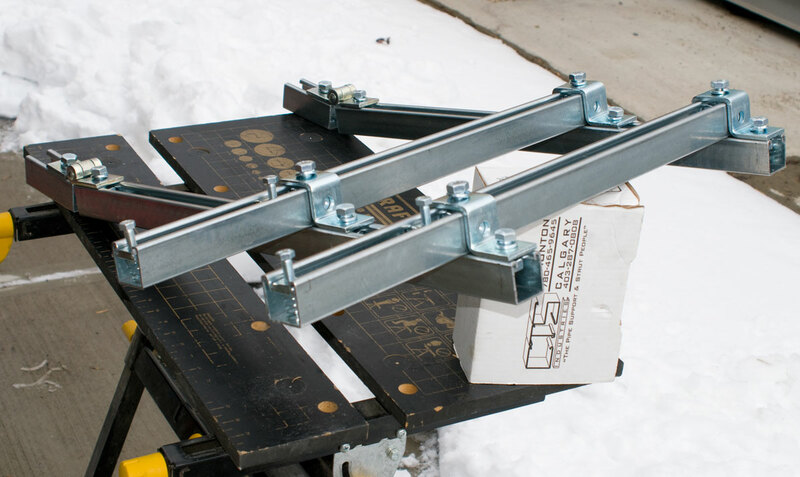 From some inquiries with other printer/bloggers, I discovered that the feed and delivery table on my press was not the original, and I searched out the info about what size the original might have been. There is a fair bit of conflicting info about the tables out there. In the end, that was not the most important anyway. I only had the one oak plank, and whatever I was going to make would be from it. A friend helped me out with biscuit cutting the two places where the boards that I had cut out would have to be joined to make the working surfaces. Using some 30 year old Industrial Formulators epoxy I glued the pieces together. After some tiring sanding, first with 120 grit and then with 220 grit I got the boards into shape. Next I thought I’d try something I had never done, cover the working surfaces with clear epoxy finish. That worked out very well, only one little tiny fly lost its life in the final coat. If you plan on doing this sort of thing I can only recommend doing what I did – make it in two coats! 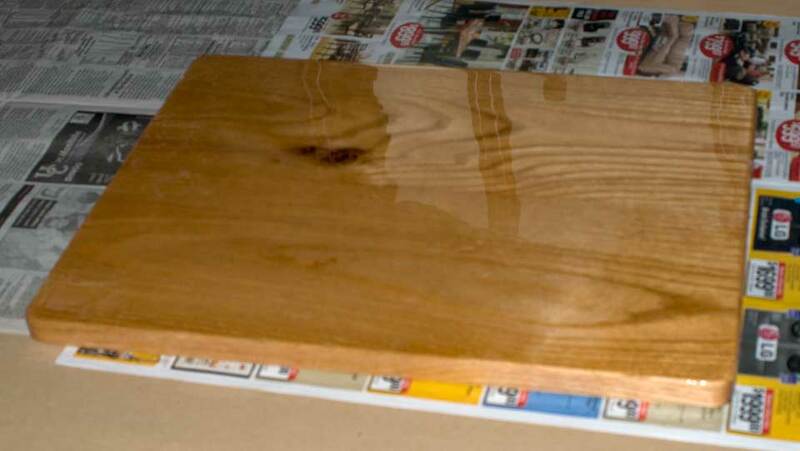 The first coat will seal the surface and even if you get bubbles in it (you will because the open grain areas of the wood spawn bubbles like crazy) – you can sand them out. Then for the second coat you only have to watch for flies and bugs. And then earlier in the week I removed the platen, just about too heavy for me to move by myself. The reason I removed it was because I discovered the platen needed to be moved closer to the press bed by about 1/8 inch. Once I tried making the adjustment I found that the mounting studs were really binding. 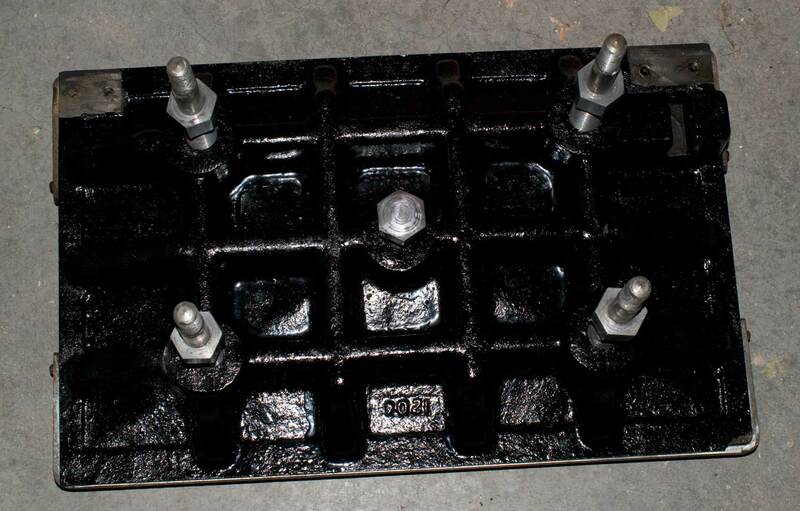 Also it makes it a lot easier to clean under the center part of the press. After considerable back and forth I am back to where I started. When I got the press there were only two of the three ink rollers present. Since I am going to use the press to print from engravings rather than from movable type (individually placed lead letter forms), the inking procedure is maybe a bit more critical. The rollers are built on a steel core of 9/16″ diameter, with the center 20″ covered with rubber to a two inch diameter. The roller trucks are slightly smaller in diameter, the idea being that the rollers are moved along by the trucks rolling on the rail until the part of the form that needs to be coated with ink is contacted by the rubber roller and sightly lifted, with the roller now rolling along the surface of the engraving (inking it). Due to a chance encounter with a structural engineer in a coffee shop I got an education in the deflection/deformation experienced by the rollers as they move over the form (the parts of the engraving that gets coated with ink). Dave is his name, and after I asked about the workability of higher quality steel versus the original mild steel rods, he told me that I was addressing the wrong valiable. With a solid rod the strength of the steel has only a minor effect on deflection. He then explained the equations behind the resistance to deflection in a rod versus a tube, that is where the improvement can be had – making the portion under the rubber a tube would make it a lot more rigid. Great, now I had a mission. I determined that a one inch OD tube would be ideal, would result in a half inch coating of rubber to get to the original two inch roller OD. Now I just had to figure out a way to insert the 9/16″ rods in both ends of the 20″ long tube and then everything in the roller saddle areas would be back to the original version. 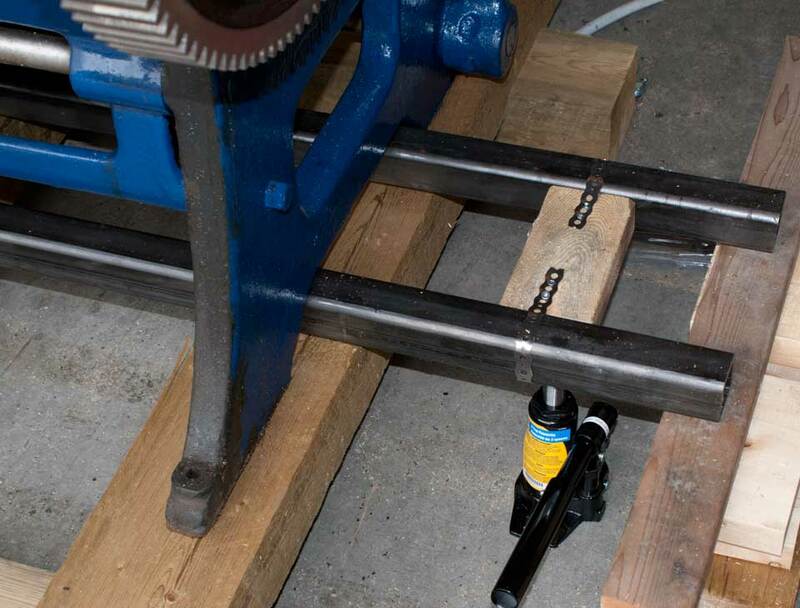 My approach to this is to get the tube line drilled at the ends, for say 3″ and to – with a slight interference fit – hammer in the shaft stubs for each end. About one inch from the end of the tube a 1/8″ hole can then be drilled perpendicular through the tube and shaft, and a spring pin hammered in to hold things together. Another set of spring pins can be used to hold the delrin trucks in place, and since they are made to specifications I can get them made the same diameter as the roller OD. The first bit of new progress after a long cold winter. 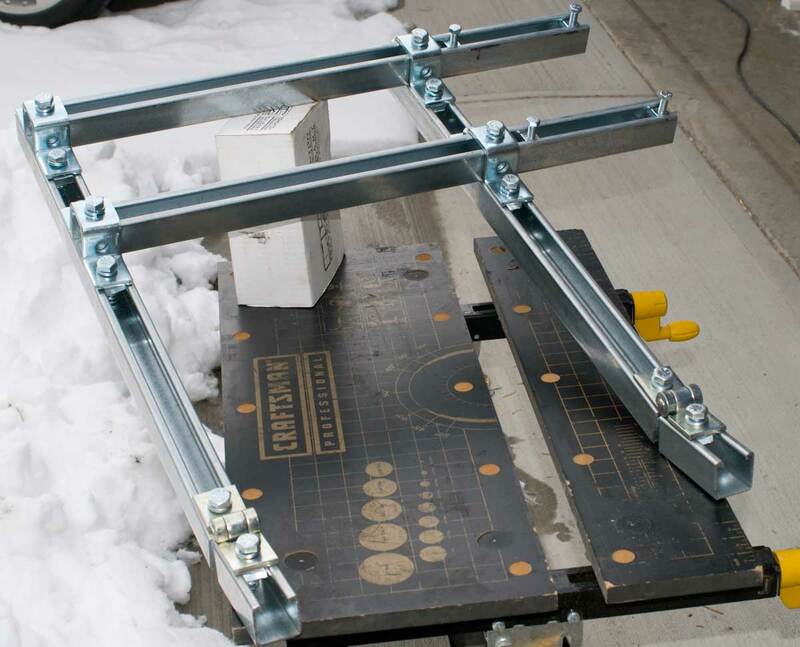 I’ve cut the pieces of Canstrut (or Unistrut whichever name you like best) and test assembled them. I’m guessing a bit for the motor size, but the Canstrut design I came up with is quite adjustable. The short sections with the hinges attached will get positioned between the press frame side panel castings. 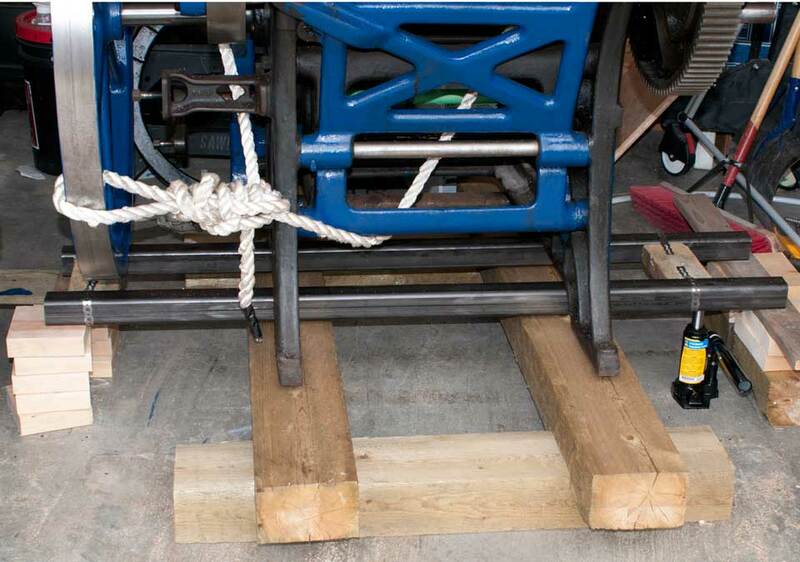 Once mounted, the motor will by its own weight keep the belt tight. Now I’m just waiting for the motor, and waiting for the last bit of snow to disappear. This picture is from the corner of the platform that will hold the motor (where the four bolts are sticking up). Once I got the press up onto the cross-beams I got to thinking about the cleaning up and oil and ink that will drip down as time goes on. So I thought about a drip tray to catch all that stuff rather than letting it pile up on the rather rough wood beams which will just make a mess. I saw a real nice drip tray under a Heidelberg Windmill press in Vancouver. It was made of galvanized sheet metal and the edges were formed (rolled) around a rod about 3/8″ diameter, and that was the edge. I visited several sheet metal shops but did not find one where I could get that done. So I started talking about options – well you know it turned out to be only $60 more to have the drip tray done in stainless steel. The shop guy I talked to came up with a couple of real nice contributions: Because of going to stainless we could drop from 16 gauge to 18 gauge with roughly equal strength – but now the edge is quite sharp. So he suggested a folded edge, and then to improve the looks and make it easier for cleanup, the edge will be bent to 60 degrees only (not 90 degrees as would be normal). I will have to wait for a few more weeks before I see to result (and so will you). Ah yes, after some struggle the press is “put to bed”. Actually more correct she is put on her bed. It took a while because one, I was discouraged about the paint issue, and second I had chased around tying to get square tubing to lift the press to get the old storage pallet out from under her. There were two misfires where I bought material of too small a cross-section, and then I was waiting for the four foot length of 2″ square tubing to come into Princess Auto as promised – and that never happened. So I finally took the time and went to a proper metal supplier in the industrial area and got two 4 1/2 foot lengths cut. That made the job almost easy. If you look at the pictures I put both lengths under the very bottom frame. In that cut-back in the cast iron frame – between the feet formed in the side castings there is not all that much room sideways. So I kind of predicted the lift would be a bit tippy, that’s why I closed the press and tied it up, getting the center of gravity more to the middle. I have a little 2000 lbs bottle jack, and with some chopped up 2×6″ (and some 1×4″ required because it gets really wobbly if you try to lift 1 1/2″ at one time). As you can see it worked fine, just don’t plan on leaving a press in that position unattended. In the above picture the press is suspended by the two 2′ x 2″ square tubing pieces on the wood block piles on either side. It’s not that obvious because I did not lift any more than half an inch higher than required to slip the timbers in place. 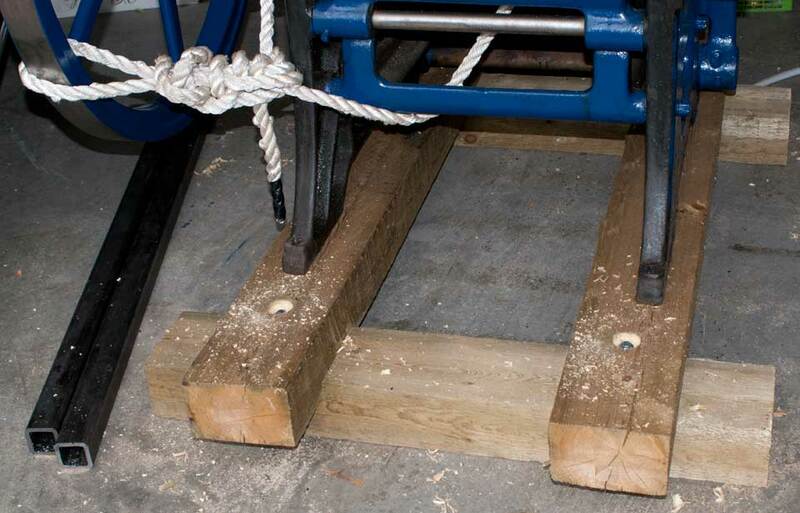 Here is a better angle to show the spreader block I decided to fasten in place. The opening between the feet formed by the cast side panels of the press frame is not that wide and I was concerned the very smooth outside of the square tubing could slip (or roll) during the jacking procedure. Here the press is finally put to bed. And has it rained and been cold! Until Wordpress gets a Follower widget: Enter your email for notices of new stuff.